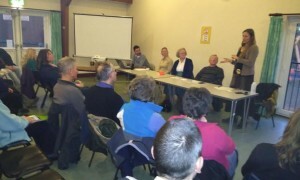 More than 50 local residents came to Hookwood Memorial Hall on Sunday afternoon for a meeting hosted by Frack Free Surrey to discuss the current and potential future operations at Horse Hill. The meeting opened with an eloquent speech and poem by 11-year-old Jemima from Hookwood, who reminded us all of the importance of keeping a safe world for children to grow up in. Lisa Scott, a local resident, gave a detailed presentation of what is happening at Horse Hill. She explained that ‘flow testing’ is under way as Horse Hill Developments Ltd (HHDL) is testing oil flows at three different levels: the Upper and Lower Kimmeridge limestones and the Portland sandstone. While the Portland can yield conventional oil, the Kimmeridge layers would require unconventional methods to extract it. Lisa outlined the potential negative impacts of unconventional oil extraction including falling house values, the inability to insure homes and farmland against damage or contamination, and industrialisation of the south east. And she exposed some popular myths, including that fracking will provide energy security for the UK and lower energy prices – it won’t – and that it will create large numbers of jobs. Charles Metcalfe from Balcombe told how when fracking company Cuadrilla arrived in his village, villagers quickly realised that this was something they did not want in their community. Charles outlined the difference between ‘conventional’ oil and gas, which can be extracted from underground reservoirs just by the natural pressure of the wells and pumping or compression operations, and ‘unconventional’ oil and gas, which is trapped in rock and needs extreme technologies to free it. At Horse Hill the likely technique is ‘acid stimulation’, potentially using hydrofluoric acid, a seriously toxic chemical. Charles said that while Balcombe villagers were initially uncomfortable about the arrival of protestors, they quickly appreciated their presence and the valuable role they played in raising awareness and slowing down operations at the site. Cuadrilla has permission to flow test the well it drilled in Balcombe in 2013 but has not yet done so. He talked about the way the Government has rolled back regulation, removing local planning authorities’ powers. The Secretary of State, for Energy and Climate Change, now has the power to overturn any local planning decision. The Environment Agency has been downsized and lacks the capacity to regulate the onshore oil and gas industry – as seen by numerous failings in Balcombe. 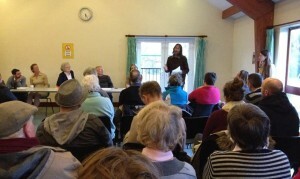 One of the Horse Hill protectors, Colin spoke next (pictured above). He explained that the camp is there to raise awareness and be a focal point for the campaign – a place where residents can meet each other and make their opposition to the drilling visible. Colin invited residents to visit the camp to meet activists, have a cuppa and a chat, and hopefully be inspired by their passion and commitment. He also invited residents to come and see the protectors in action slowing down HGV trucks delivering to the drill site, and to bear witness to what is happening then. While peaceful protest is legal and part of our democratic tradition, the police have reacted to protectors with bullying and threats. Colin said, “Sometimes these camps are referred to as community protection camps – but ultimately, only the community can protect itself. “The Government and industry are not afraid of us activists and eco-warriors. But the government is afraid of you, because when the community really comes together to take a stand against something, that is where the real power lies. Not with the few who live in mansions or tax havens elsewhere, and not with the few who dedicate their lives to opposing the short-sighted and greedy few. Vanessa Vine was the last speaker. A mother living four miles from Balcombe, Vanessa founded Frack Free Sussex in response to Cuadrilla’s designs on her local environment and subsequently also founded BIFF! (Britain & Ireland Frack Free). She spoke of how government and industry appear to be colluding in misleading people into believing that dangerous unconventional drilling operations are safe, not least by changing the definition of fracking. Hydraulic fracturing is now officially defined by fluid volumes used, so companies can now undertake low-volume fracking without needing to apply for a fracking licence. Vanessa talked of the terrible harm done by the extreme energy industry in Australia and North America – as evident in the ‘List of the Harmed‘ – and cautioned awareness that the mainstream media is letting industry spokespeople go unquestioned. Vanessa said that initially, many Balcombe residents did not take the threat posed to their community seriously, believing that the government wouldn’t allow something that wasn’t safe, and later came to bitterly regret their early complacency. She warned that regulation of knock-on effects in subterranean geology is impossible, and that new legislation could potentially lead to toxic/radioactive waste being dumped in abandoned boreholes. The meeting was followed by questions and discussion, and informal conversations continued over tea and cakes. All who had attended were encouraged to continue to inform themselves, and to visit the camp at the bottom of Horse Hill to meet and support the protectors. At the end of this meeting, a meeting to discuss next steps was suggested. Will this be taking place? If so, when? Hello Heidi, Thanks again for coming to the meeting. We are discussing next steps and there will be a follow-up meeting but we haven’t fixed a date yet. If you signed our sign-up sheet, you will get an email today. Otherwise, keep an eye on this website for updates.